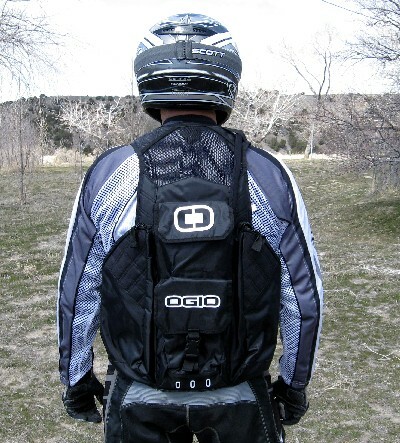 Bluffdale, Utah based OGIO is known more for golf bags, hats and casual backpacks than for serious motorcycle gear, but that may change as word spreads about the excellent Flight Vest. The OGIO Flight Vest is extremely well-built, and one of the most useful and utilitarian carrying systems for small items we've ever sampled. Fit, detail and function are all first-rate. As far as we're concerned the Flight Vest is about the best thing since the invention of sliced whole-wheat bread. Just like you, we at MoJazz have spent many years stuffing power bars, tools and cameras in the storage pocket of our hydration packs and cursed lost photo opportunities as we were forced to stop in order to remove the pack and fumble past the Leatherman tool and black cherry granola to retrieve the camera - only to find that our subject had already been knocked off their bike, trampled and pushed over the side of a nearby cliff by the charging moose. Nothing ruins the day quite like missing such a shot. 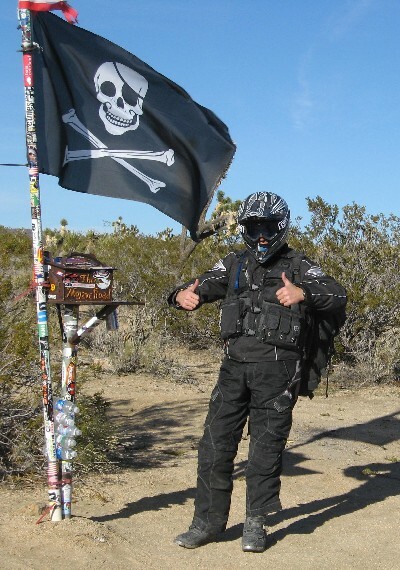 By riding with a MacGyver-chic Flight Vest, not only are you much less likely to miss such essential action photos but you can stay conveniently well-hydrated, well-fed, well-supplied against the elements and tooled to the max all at the same time. The Flight Vest is so full of useful nooks and crannies that it boggles the mind. There are no less that twelve, count 'em, twelve pockets of various sizes and shapes all secured with a zipper, Velcro or buckle. The zippers are all of exceptional quality and tabbed in a manner that makes them very easy to operate with gloved hands. You can even retrieve your compact digital camera on the fly! Just in case twelve pockets aren't enough there is an additional unsecured stash pocket on the right lapel, several loops for film canisters and plenty of attachment points. We think that the film canister loops, in the digital age, are about the only superfluous feature of the Flight Vest. Film is so... 90's. What else, we wonder, would you want to carry in so many film containers? The supplied 2.0 liter hydration bladder is well-made and completely adequate for short rides. The tube is insulated and formed to stay in place over the shoulder and the bite valve has an additional on/off setting. We had no trouble fitting a larger 3.0 liter bladder into the hydration sleeve on the back of the vest. 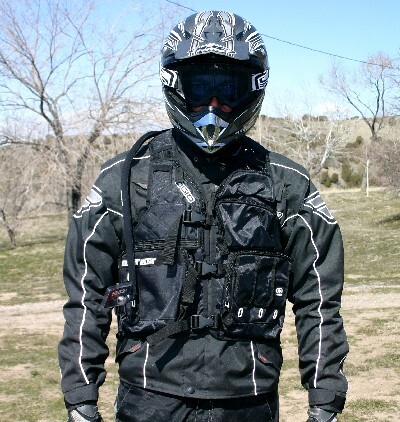 The Flight Vest is designed in a "one size fits most" motif that works well for normal sized adult males. 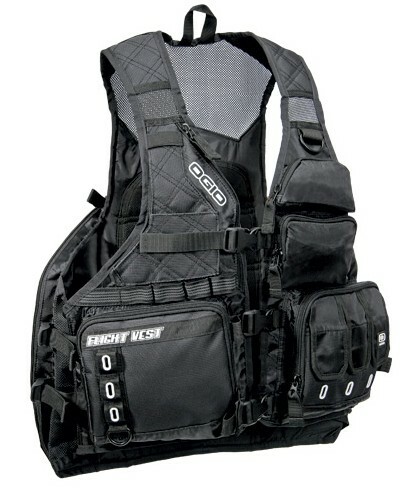 Two sets of adjustment straps fastened with nylon side release buckles are located on each side of the vest (along with panel zippers) and with the three on the front allow a wide range of size adjustments for a torso of most any thickness. The length, however, is not adjustable. Mesh panels allow plenty of ventilation for warm weather rides. Aside from ease of access the best feature about the Flight Vest, and one of the primary reasons we like it much better than a backpack, is that it is very easy to distribute the weight of your stuff evenly around the torso. 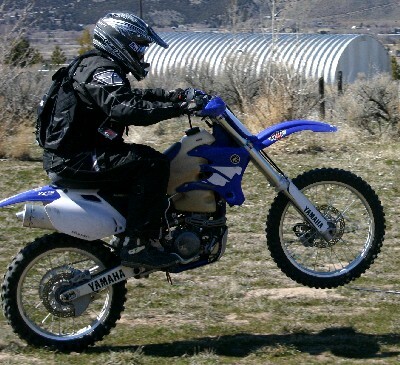 This is a considerable advantage in aggressive trail riding and enduros where good balance is essential. We've even seen Flight Vests adorning nattily attired skiers in Sun Valley. Is it too early to suggest a pitch for product placement in Mission Impossible IV? Though we had no trouble fitting a larger 3.0 liter bladder into the hydration sleeve on the back of the vest the increased volume of water did increase rearward weight bias. The Rad: You'll officially look important. Get your SPOT Connect right now at Competition Accessories.